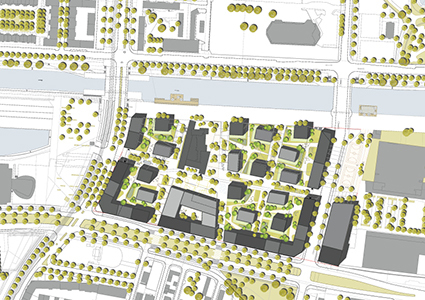 Landscape and urban design for a new ecological mixed-use neighborhood on a former industrial harbour. 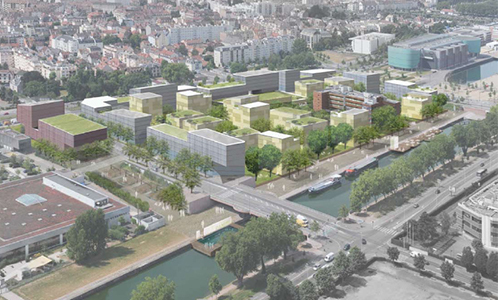 Surrounded by major infrastructures on 3 sides, this urban ensemble is protected by a build envelope that creates a strong urban front as well as a calm and green interior open to the canal de jonction to the north. Cars (0.5/dwelling) are parked under east and west buildings, allowing the neighborhood to be totally dedicated to bikes and pedestrians. 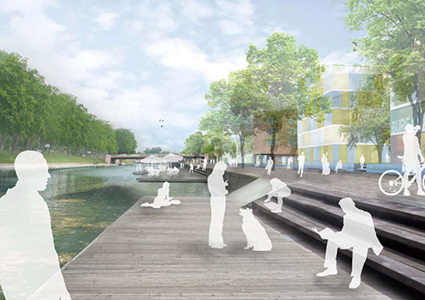 The structure of the masterplan creates strong connections with surrounding neighborhoods, public spaces and public transport network, while the various orientation of the buildings create an informal and differentiated interior. Facilities, elderly home and school are located at the cross-point of the two main streets, giving a lively heart to this urban oasis.